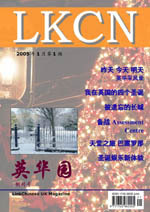 In the launching issue, LKCN Magazine interviewed five young Chinese, all of them are studying in UK or have finished their education in UK recently. Meng Gao is an Oxford graduate and now working in a management consultancy in Hong Kong. She expressed her fondness of the time she spent in Oxford. Meanwhile, Xu Jingjing, who has just started her PhD in Chemistry in Edinburgh Unversity, is very excited about the university and city she has just arrived. Other interviewees have also exprssed their thoughts about their higher education experiences in UK from personal perspective. The interviews (Ying Hua Cai Feng) proved so popular that it has yet become a permanet section of the magazine.